This description might sound pretentious, but the book is compulsively readable. The narrator’s diary entries detail anxieties, conversations, creative outbursts—it often reads like a much more interesting version of creative writing journals kept by writing students for classes. The contained claustrophobia of the diary entries enhance the descriptions of the too-small apartment the narrator and Z share, her obsessive analysis of conversations and interactions with both Z and Elodie, her intellectual and sexual desires. Elodie is in many ways the flipside of the narrator: another Englishwoman vacationing in Paris, another artist, another social performer trying on personae like clothes. Words are interchangeable with objects, one-liners with dresses. Sometimes this is a weakness in storytelling—occasionally, and especially at the beginning, the prose is overly florid and bogs itself down in description. Often, however, it works to further define the untrustworthy narrator. There is a certain kind of young writer who is in love with the act of writing itself, the love of art and the making of art. This is often the same sort of writer who obsesses over writerly places—like Paris—and their history. The narrator is exactly this sort of person, and as written by Kendall, what she lacks in freshness she makes up for in the genuineness of the portrayal. 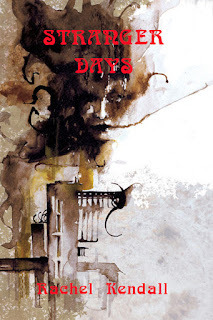 Stranger Days is not a genre novel as such, though at times it flirts with dark fantasy. Hints are given that Elodie is not what she seems, lending a pseudo-gothic atmosphere to what is otherwise a contemporary setting. Mental claustrophobia often echoes physical claustrophobia, such that the grand sprawl of Paris seems like an extended neighborhood where people easily bump into one another. There are references scattered throughout the book to the narrator’s depressions, including self-harm, but the conclusion—which I do not want to spoil here—comes off as problematic and even somewhat offensive. The narrator suffers from an unspecified clinical condition that exacerbates her unreliable point of view and keeps the plot moving, but while Kendall’s skill emphasizes the viscerality of the condition, using this trope for horror seems problematic to me. Mental health illnesses are something that approximately 1 in 5 adults, according to the World Health Organization, struggle with on a daily basis, and yet culturally we still stigmatize people who suffer from various conditions. There are several shocking scenes of physical and emotional violence in the book, and that the narrator concludes that she doesn’t want to take her medications because they “fog [her] mind” and that she “just wanted to be someone else for a while” (149) seems oddly old-fashioned rather than entirely self-destructive. A number of organizations have worked very hard to de-stigmatize and raise popular awareness of mental health issues, and the vague nature of the narrator’s ailment, coupled with how she and Z manage it (or don’t manage it) seems particularly at odds with how Kendall has taken such pains with detail in the rest of the novel. Stranger Days is an entertaining read, but it perhaps more suited for lovers of A Movable Feast than, say, Nausea. It is a book about Paris largely without Parisians, about artists who are creating but have yet to finish an artwork. It is a performance rather than a story—and while that has merit, too, it draws attention to itself in a way that doesn’t always work for some readers. In short, this would be an ideal book for a writing workshop group as a way to jumpstart conversations, but may leave others cold. It will, however, create quite a bit of fodder for discussion—on art, on the artist’s life, and what is real or unreal. Thanks for taking the time to read and review my book Cait. I found what you said about mental illness really interesting, mostly because a lot of comments and descriptions of mental health in the novel are taken from my own diary. I wonder what makes you suggest that I have used this trope for horror. Are you referring to the horror genre or the generalised horror apparent in many peoples lives? If the book was suggested to you as horror material I fear you have been short-changed and that is a shame. Still, I would sincerely love to hear your response.